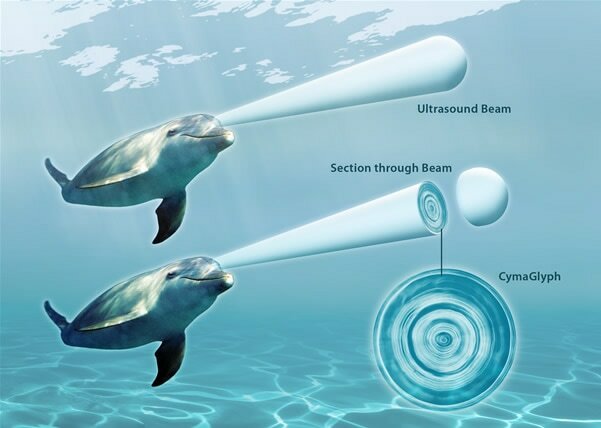 This is why I am both deeply grateful and amazed by the work of John Reid, the UK inventor of the cymascope -- a technology that renders sound visible. In an article published on his website titled, “Cymatics -- A Bridge To the Unseen World”, John and his wife Annaliese reveal facts about sound that are simply mind-blowing and worthy of far greater dissemination. First, did you know that sound is actually not a wave but a spheroidal phenomenon? “You create infrared light even when you speak...The atoms and molecules of air within this expanding bubble are bumping into each other, each collision transferring your voice vibrations to the nearest atom or molecule. As these ‘bumps' occur they cause infrared light to be created due to the friction between the magnetic shells of the air particles. The infrared light carries with it the modulations of your voice that rush away at the incredible speed of 186,000 miles per second. Unlike the sound of a voice, which becomes inaudible after about one mile, the infrared light created by your voice rushes out into space, where it travels for eternity, carrying your words or songs to the stars. "Mantras are not small things, mantras have power. They are the mind vibration in relationship to the Cosmos. The science of mantra is based on the knowledge that sound is a form of energy having structure, power and a definite predictable effect on the chakras and the human psyche." We live in a remarkable time where what was once purely the stuff of myth, and considered magical thinking and “woo" by skeptics the world over, is starting to receive validation through the 'hardest of sciences'. For instance, the concept of the body radiating light is now also accepted through the discovery of biophotons, which we reported on in a previous article, and even the ritual of burning medicinal herb sage to 'ward off evil spirits' has been found to have powerful cleansing properties. That said, the most powerful way to understand information like this is to experience it directly. I encourage readers to experience the tradition of mantra directly. Listen or recite them, and visualize the sound actually moving at tremendous speed and producing light that is extending out into the farthest reaches of the universe. Perhaps then the aphorisms of spiritual masters like Yogi Bhajan will no longer seem strange and unattainable. To learn more about the CymaScope and a related project Sayer Ji and John Reid are partnering on, take a look at SystomeBiomed.com. Original Kirtan Kriya Kundalini Yoga Meditation with the Mantra Sa Ta Na Ma. Duration: 30 minutes. Music and Meditation performed by Tera Naam. Sit straight in Easy Pose. EYE POSITION: Meditate at the Brow Point. This is the cycle of Creation. From the Infinite comes life and individual existence. From life comes death or change. From death comes the rebirth of consciousness to the joy of the Infinite through which compassion leads back to life. MUDRA: This mantra can be done in many different mudras. Most common is to begin in Gyan Mudra. The elbows are straight while chanting, and the mudra changes as each fingertip touches in turn the tip of the thumb with firm pressure. The duration of the meditation may vary, as long as the proportion of loud, whisper, silent, whisper, loud is maintained. TO END: This sequence will take 30 minutes. Follow with one minute of silent prayer. Then inhale, exhale. Stretch the spine, with hands up as far as possible; spread the fingers wide, taking several deep breaths. Relax. Each time the mudra is closed by joining the thumb with a finger, the ego “seals” the effect of that mudra in the consciousness. This meditation brings a total mental balance to the individual psyche. Vibrating on each fingertip alternates the electrical polarities. The index and ring fingers are electrically negative, relative to the other fingers. This causes a balance in the electromagnetic projection of the aura. Practicing this meditation is both a science and an art. It is an art in the way it molds consciousness and in the refinement of sensation and insight it produces. It is a science in the tested certainty of the results each technique produces. Meditations have coded actions to their reactions in the psyche. But because Kirtan Kriya is effective and exact, it can also lead to problems if not done properly. Yogi Bhajan said at Winter Solstice 1972 that a person who wears pure white and meditates on this sound current for 2-1/2 hours a day for one year, will know the unknowable, and see the unseeable. Through this constant practice, the mind awakens to the infinite capacity of the soul for sacrifice, service and creation. (Source: The Aquarian Teacher, Manual. © Yogi Bhajan Teachings. Sharpens the ability to acquire knowledge. It protects us from harm. It provides state of fullness. Ensures a bright and auspicious future. It provides you with inexhaustible strength to overcome all obstacles. Released from the wheel of birth and death. It is the key that unlocks the door of cosmic consciousness. Confers wisdom, prosperity, purity and liberation. This article is not intended to provide medical advice, diagnosis or treatment. Views expressed here do not necessarily reflect those of GreenMedInfo or its staff. "© 11 May 2017 GreenMedInfo LLC. This work is reproduced and distributed with the permission of GreenMedInfo LLC.